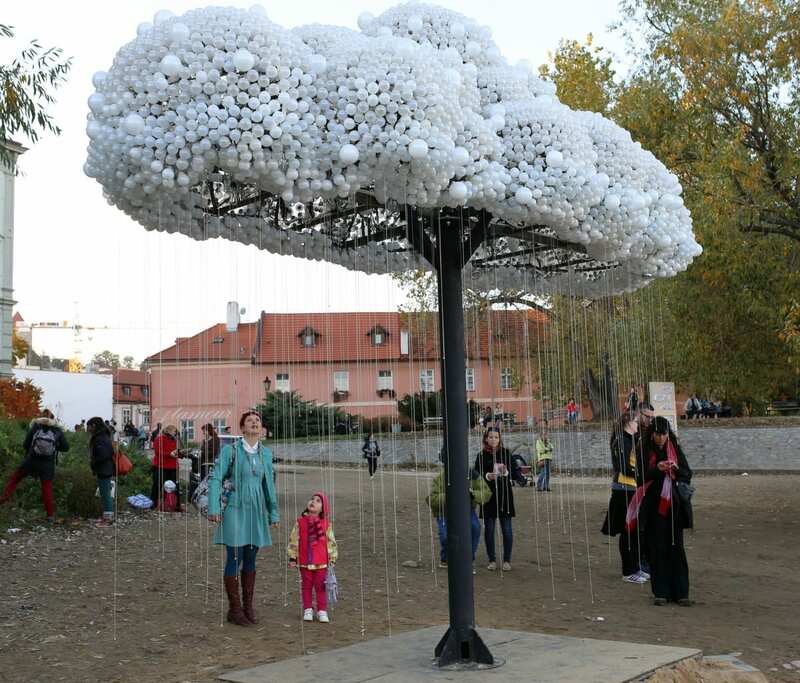 CLOUD is a whimsical, interactive sculpture created by Canadian artists Caitlind Brown and Wayne Garrett. 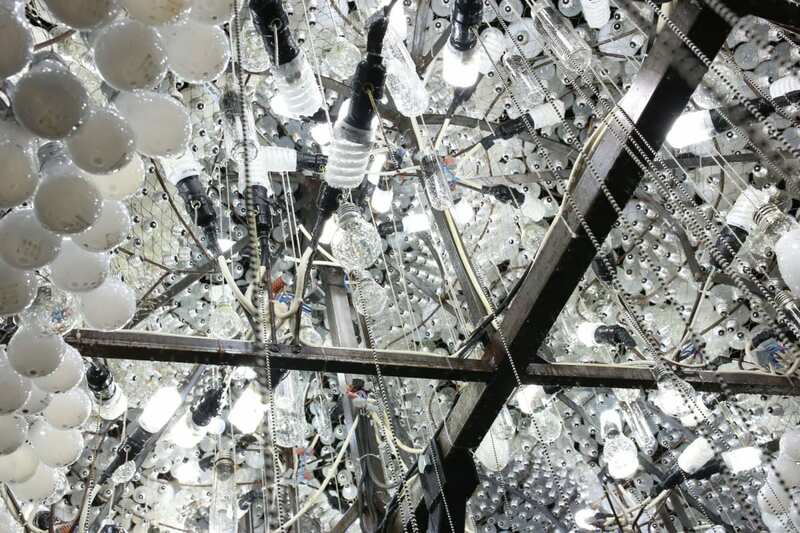 Conceived as a light-hearted contraption to encourage casual collaboration and play, the sculpture is built from 6,000 incandescent light bulbs, hand-bent steel, electronics, pull chain, and internal compact fluorescent light bulbs. 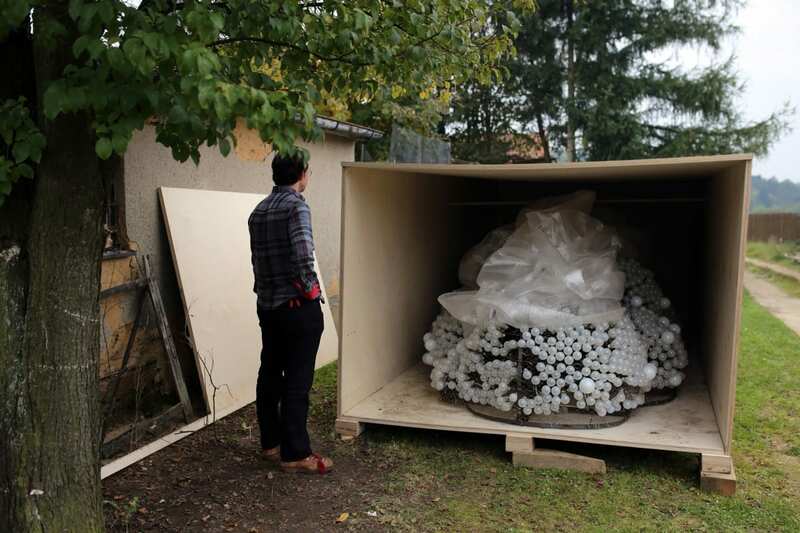 The second edition of CLOUD was recently shipped to Prague from Moscow, where it had been sitting under a tarp behind Garage Center for Contemporary Culture for the better part of eight months. 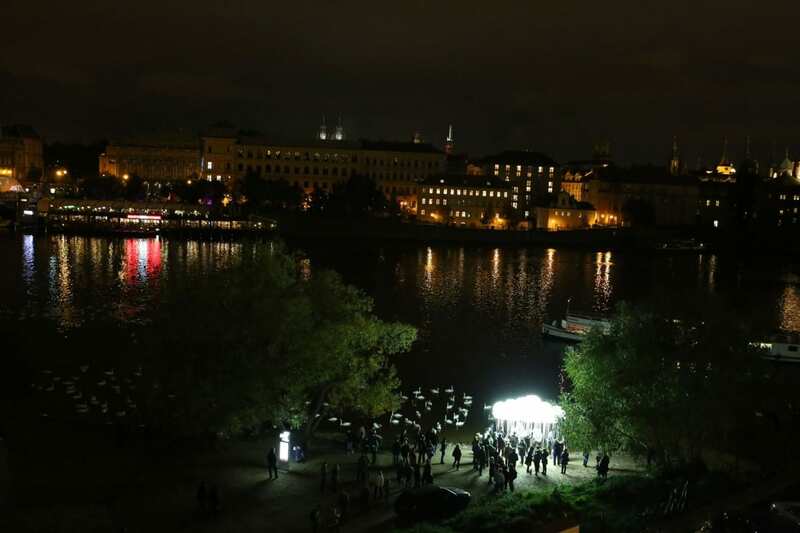 The sculpture was invited to participate in the first rendition of Signal Festival last weekend – a festival of light designed to enliven historical spaces in Prague, and illuminate forgotten pockets of the city. After significant cleaning, repairs, buffing, and tweaking, CLOUD was installed in an beautiful cobble-stoned inset along the Vltava river, within ideal viewing range of Charles Bridge. 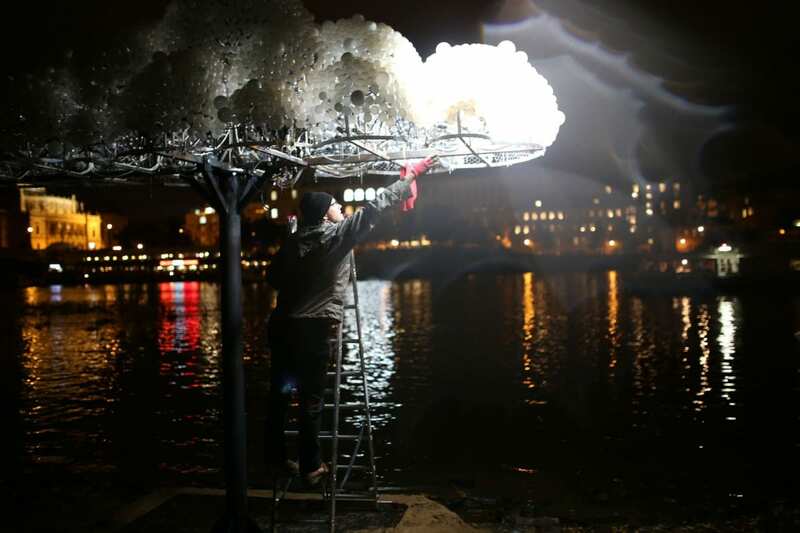 The real magic began when Czech visitors and tourists alike began tugging on CLOUD’s pull chain rain drops, animating the sculpture and sending luminous beams of white light glittering into the nearby river. 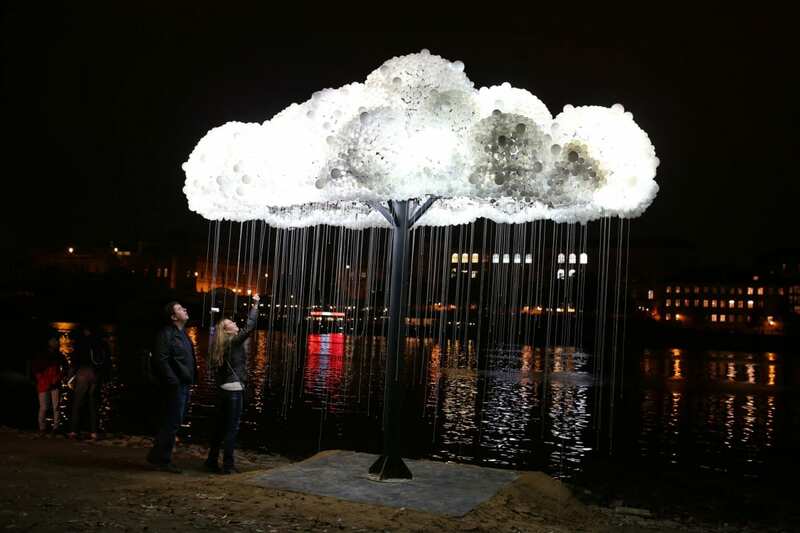 CLOUD’s next appearance will be at GLOW Festival in Eindhoven, Netherlands from November 9 – 16, 2013. Wayne Garrett inspecting the second edition of CLOUD after the sculpture was shipped from Russia. The sculpture sat outside, beneath a tarp, for 8 months before being shipped to Signal Festival in Prague. Mending the internals of the (badly weathered) CLOUD before Signal Festival in October. Lowering CLOUD onto its base beside the Vltava River, within viewing distance of the historic Charles Bridge. Late night electrical tests before Signal Festival began. A mother and child inspecting CLOUD before the festival opening night. First viewers brave enough to interact with CLOUD at Signal Festival. 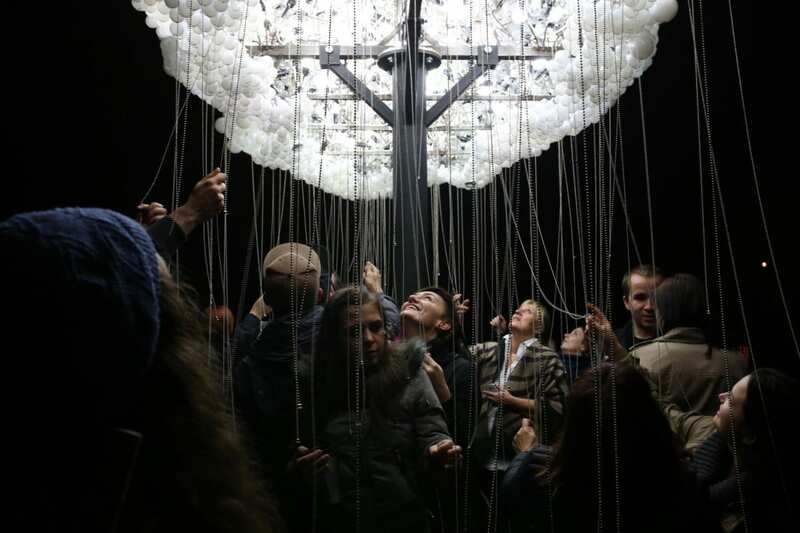 The underside of CLOUD, made up of pull strings, compact fluorescent light bulbs, hand-bent steel, and more. Crowds playing with CLOUD at Signal Festival. View of CLOUD from above (note the gathering of swans in the surrounding water). 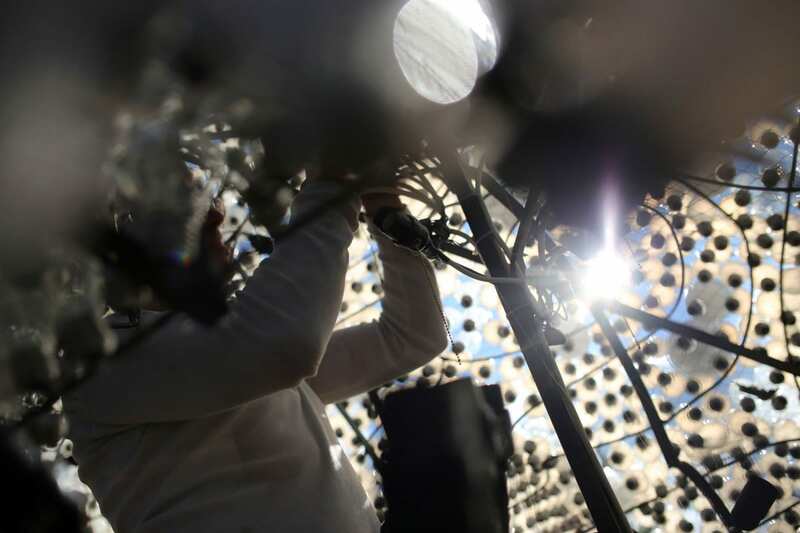  Archived in Architecture, Art, Design, Public, Technology and tagged Caitlind Brown, Canada, Cloud, Issue 31, Light, Signal Festival, Wayne Garrett. Bookmark the permalink.